This was not the first time that the common citizen of Pakistan felt helpless and hostage to a group of religious parties that rejects the verdict of the highest court and brings the country to a virtual standstill. After the televised speech of Prime Minister Imran Khan one had expected that the government’s response would be different and it would deal firmly with all those who are blatantly defying the law and trying to impose their will to reverse the court verdict. But it was the same policy of appeasement that seeks a peaceful solution through negotiations. One, however, wonders what exactly is negotiable when a party refuses to accept the highest court verdict, falsifies facts and whips up emotion and religious frenzy. Their vitriolic language against the judiciary and army was tantamount to treason. Moreover, what is blatantly hypocritical is that many of the foot soldiers of this brigade were urchins that damaged government and public property and committed acts that violate fundamental principles of Islam and common ethical values. 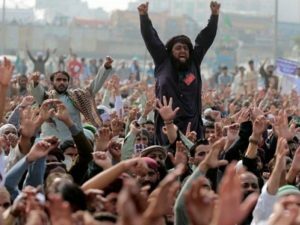 Unfortunately, Sufi Islam that was once perceived for being more inclusive and tolerant towards different sects and creeds has lately been highly politicised and acquired an aggressive posture witnessed especially during the trial of Aasia Bibi and in the subsequent sit-ins organised by its parties. The reasons for the government to be defensive and capitulate so easily are not difficult to comprehend. It does not have sufficient moral courage and political strength and consequently has left the decision to enforce rule of law on the judiciary. While in fact the basic responsibility of it rests entirely with the political government. More pertinent is how long would successive governments and state institutions succumb to such blackmail and continue overlooking these crimes and repeat past mistakes? The way the government sought peace with the militant groups was short of surrender. While the resolute words of the PM were still resonating in our ears, the subsequent decisions and humiliating stance by the ministers belied it in totality. State institutions having invested deeply in proxies over the years as part of foreign policy goals or to weaken democratic forces are turning against the state itself. This trend of supporting non-state actors has been in vogue for years and continues for narrow political and expedient reasons. A glaring contradiction is that the government handles peaceful protests of civil society organisations with utmost brutality. In these it negates the very basic principles of democracy and denies its citizens the right to dissent peacefully. It is as much a sad reflection of the level of insecurity of state institutions that these cannot tolerate individuals and groups that draw attention to its weaknesses and injustices. Similarly, while the government is allowing these rabid NGOs to operate freely but in sharp contrast is hyper sensitive to the presence of foreign NGOs. The policy has resulted in several international NGOs’ licences being revoked drawing serious criticism from Western countries and international organisations and depriving hundreds of Pakistanis of their livelihood. Of course, if any of these NGOs were misusing its authority, these should be banned as was done in the case of Shakil Afridi who ran a fake vaccine programme to assist the CIA in tracking Osama bin laden. But on mere suspicion ousting other NGOs may not serve our national interest. While majority of the religious leaders and political parties rejected the court decision it is encouraging that at least few prominent ones endorsed it, being in conformity with the teachings of Islam. Pakistan even after 71 years has yet to discover its identity and the struggle for its soul continues. The gap between Pakistan of the Qaid-e-Azam’s dreams and the present state of the country keeps widening and cannot be overlooked. All the talk of a ‘new Pakistan’ and the turnaround will remain castles in the air. In a recent interview to a foreign correspondent, Minister of Information Fawad Chaudhry remarked that the government’s response against the protestors was only to tide over the immediate crisis. And long-term measures would be necessary to fight the menace of obscurantism. The statement was encouraging but the government’s credibility rests on how faithfully it is implemented. For there is no alternative but to fight this threat at the national level in a very well-planned and holistic manner with the full involvement of all the state actors and institutions. The people would be keenly watching as to if and when these pronouncements would materialise. Otherwise with this level of obscurantism and negativism prevailing in significant sections of the society all the dreams of a ‘Naya Pakistan’ will fade away. A comprehensive plan to fight extremism and neutralising the role of organisations that are preaching hatred and pushing their agenda should be undertaken in real earnestness. There is an urgent need to enforce and update the madrassa registration and implement monitoring the quality of religious instruction. Another area that needs urgent attention is the reform of the public education system. With education after the 18th amendment a provincial subject would require greater coordination and genuine effort to initiate and implement reforms uniformly at the national level. The National Action Plan had included all these initiatives in its 20-point plan, but as neglectful we are in implementation it has failed to achieve the desired results. The recent National Internal Security Policy covering the five-year period of the present government and having a broad consensus is another important document whose faithful compliance would reinforce the government’s resolve. Despite these failings there is genuine hope that if the civil society and other moderate forces are energised as was witnessed during the lawyers’ movement Pakistan’s direction and destiny can change. Much would depend how political parties, media and enlightened religious scholars and leaders channel religion as a force for progressive change so that Muslims and our minorities both as individuals and as Pakistanis could be counted in the community of nations.